(Francisco Kjolseth | The Salt Lake Tribune) U.S. 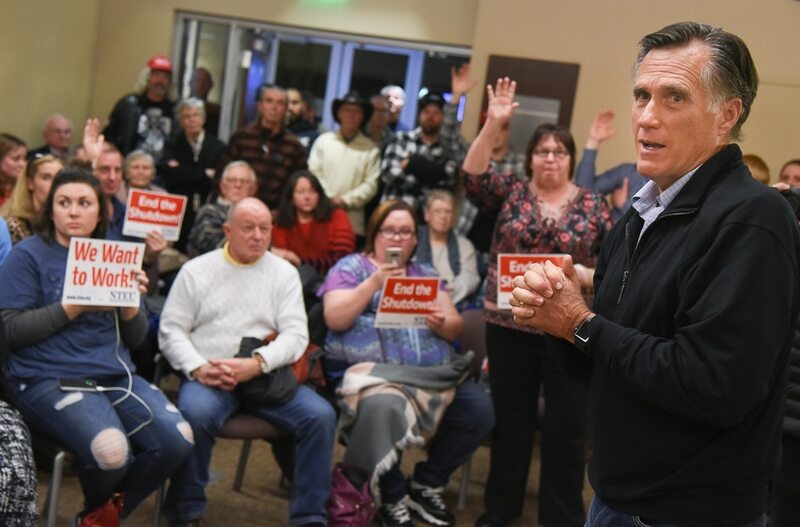 Senator Mitt Romney visits some of the overflow rooms where people expressed their anger over the federal shutdown after holding a town hall meeting at the Davis County administration building, Tuesday, January 22, 2019, to hear from local residents. (Francisco Kjolseth | The Salt Lake Tribune) U.S. Senator Mitt Romney holds a town hall meeting at the Davis County administration building, Tuesday, January 22, 2019, to hear from local residents. (Francisco Kjolseth | The Salt Lake Tribune) A long line of people line up to join U.S. Senator Mitt Romney as he gets ready to hold a town hall meeting at the Davis County administration building, Tuesday, January 22, 2019, to hear from local residents. (Francisco Kjolseth | The Salt Lake Tribune) U.S. Senator Mitt Romney arrives for his town hall meeting at the Davis County administration building, Tuesday, January 22, 2019, to hear from local residents. (Francisco Kjolseth | The Salt Lake Tribune) People sign in as U.S. Senator Mitt Romney gets ready to hold a town hall meeting at the Davis County administration building, Tuesday, January 22, 2019, to hear from local residents. (Francisco Kjolseth | The Salt Lake Tribune) U.S. Senator Mitt Romney arrives for his town hall meeting at the Davis County administration building, Tuesday, January 22, 2019, to hear from local residents. (Francisco Kjolseth | The Salt Lake Tribune) U.S. Senator Mitt Romney arrives for his town hall meeting at the Davis County administration building, Tuesday, January 22, 2019, to hear from local residents. (Francisco Kjolseth | The Salt Lake Tribune) U.S. Senator Mitt Romney, foreground, is introduced arrives for his town hall meeting at the Davis County administration building, Tuesday, January 22, 2019, to hear from local residents. (Francisco Kjolseth | The Salt Lake Tribune) U.S. Senator Mitt Romney gets ready to hold a town hall meeting in the Davis County Commissioner Chambers, Tuesday, January 22, 2019, to hear from local residents. (Francisco Kjolseth | The Salt Lake Tribune) U.S. Senator Mitt Romney gets ready to hold a town hall meeting in the Davis County Commissioner Chambers, Tuesday, January 22, 2019, to hear from local residents. (Francisco Kjolseth | The Salt Lake Tribune) U.S. Senator Mitt Romney does the pledge of allegiance prior to his town hall meeting at the Davis County administration building, Tuesday, January 22, 2019, to hear from local residents. (Francisco Kjolseth | The Salt Lake Tribune) Pam Harrison, left, and Mica Medford of Ogden get ready to join the town hall by U.S. Senator Mitt Romney at the Davis County administration building, Tuesday, January 22, 2019, to hear from local residents. We have some pointed questions, to ask the senator. (Francisco Kjolseth | The Salt Lake Tribune) U.S. Senator Mitt Romney asks multiple questions including who is upset the government is shut down as he holds a town hall meeting at the Davis County administration building, Tuesday, January 22, 2019, to hear from local residents. (Francisco Kjolseth | The Salt Lake Tribune) U.S. Senator Mitt Romney wraps up a town hall meeting at the Davis County administration building, Tuesday, January 22, 2019, to hear from local residents. (Francisco Kjolseth | The Salt Lake Tribune) U.S. Senator Mitt Romney visits some of the overflow rooms after holding a town hall meeting at the Davis County administration building, Tuesday, January 22, 2019, to hear from local residents. (Francisco Kjolseth | The Salt Lake Tribune) U.S. 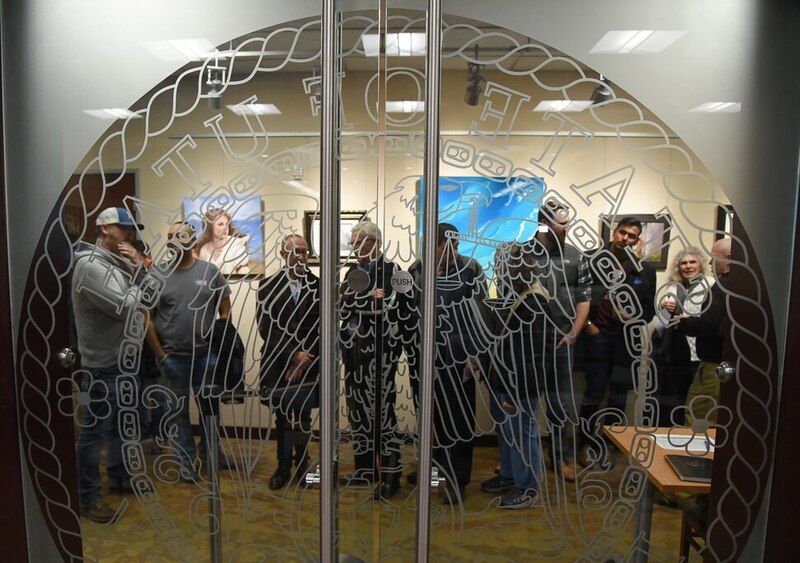 Senator Mitt Romney visits some of the overflow rooms where people expressed their anger over the federal shutdown after holding a town hall meeting at the Davis County administration building, Tuesday, January 22, 2019, to hear from local residents. (Francisco Kjolseth | The Salt Lake Tribune) U.S. Senator Mitt Romney visits some of the overflow rooms after holding a town hall meeting at the Davis County administration building, Tuesday, January 22, 2019, to hear from local residents. (Francisco Kjolseth | The Salt Lake Tribune) U.S. Senator Mitt Romney visits some of the overflow rooms after holding a town hall meeting at the Davis County administration building, Tuesday, January 22, 2019, to hear from local residents. (Francisco Kjolseth | The Salt Lake Tribune) Gordon McKinney, left, a federal worker with the IRS in Ogden shouts out his claim that a colleague with diabetes died last week because of the shutdown and was unable to buy her medications as U.S. Senator Mitt Romney visits some of the overflow rooms after holding a town hall meeting at the Davis County administration building, Tuesday, January 22, 2019, to hear from local residents. (Francisco Kjolseth | The Salt Lake Tribune) U.S. 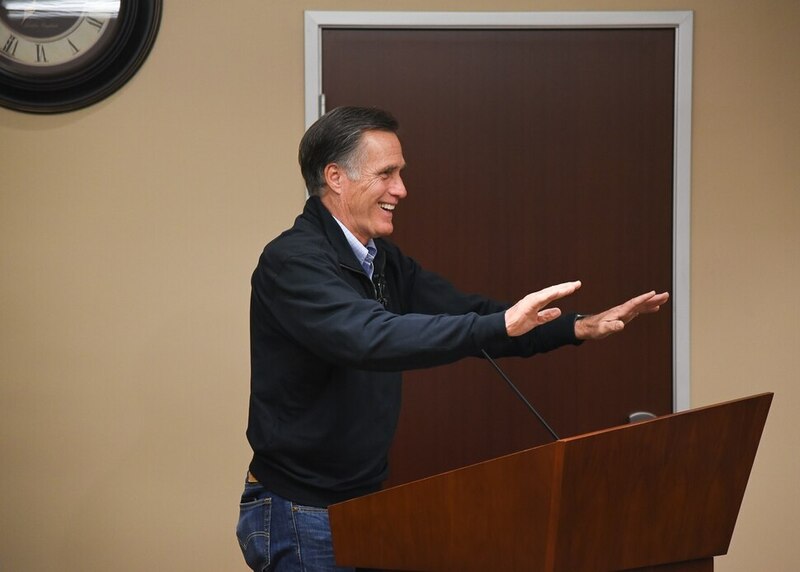 Senator Mitt Romney wraps up a town hall meeting at the Davis County administration building, Tuesday, January 22, 2019, to hear from local residents. (Francisco Kjolseth | The Salt Lake Tribune) Shelly Carver a federal worker with the IRS in Ogden tries to ask a question as U.S. Senator Mitt Romney visits some of the overflow rooms after holding a town hall meeting at the Davis County administration building, Tuesday, January 22, 2019, to hear from local residents. Farmington • Mitt Romney, Utah’s newest senator, began the first town hall meeting of his term by taking the temperature of the packed Farmington room. "How many of you are really irritated or angry about something going on in Washington?" he asked. Nearly every hand shot up in response. "How many of you are really angry about the fact that the government has shut down a major part of the economy?" he continued. Again, he stared out into a room full of raised hands. Romney told attendees at the Tuesday night meeting that he was there to listen more than to talk. But the Republican senator — who earlier this month took over the seat vacated by retired U.S. Sen. Orrin Hatch — did express his frustration that the monthlong federal shutdown is acting as a weapon in the debate over immigration policy. "We have two political parties that are battling out border security, and instead of the pain being on them, the pain is on people, American citizens," he said. "In many respects, the people are being used as pawns in a political battle for what we're going to do with regards to border security." Many of Romney’s questioners, though, wanted to know what he specifically plans to do about the impasse affecting thousands of Utah’s federal employees, residents in federally subsidized housing and the state’s national parks. In response, Romney reiterated what he told Weber County commissioners last week: That House Speaker Nancy Pelosi and President Donald Trump bear primary responsibility for ending the government shutdown. But there is little sign that congressional Democrats and Trump are closing in on a resolution. Trump over the weekend made an offer to reopen government and extend protections for some undocumented immigrants if Congress approves funding for a wall at the nation’s southern border. But Democrats have expressed unwillingness to bargain until government is reopened. Romney said Trump’s proposal seems to signal a promising openness to negotiation, adding that he hopes Pelosi responds with a good-faith counter-proposal if she dislikes the president’s initial offer. About 250 people packed the Davis County Administration Building, filling the main meeting space and a couple of overflow rooms, to hear Romney speak. The group was particularly divided over the merits of building a wall along the U.S.-Mexico border. “I feel like if you don’t have a wall ... you don’t have a country,” said Cheryl Tarbet, of Kaysville. Eliciting groans from others in the audience, Tarbet added that she's worried about an "invasion" of undocumented immigrants coming across the southern border. Mary Shinney, a U.S. Forest Service employee who lives in North Ogden, said she disagrees with the border wall in principle. But she said the shutdown has probably cost the U.S. economy almost as much as the $5.7 billion that Trump wants for a border wall. And it’s meant that she and her husband, also a federal employee, have had to go for weeks without pay, forcing them to live on their credit cards and savings. "So I'm willing to compromise," she said in an interview, her eyes filling with tears. While Romney said he does believe a barrier with Mexico should exist, he also expressed the need for more comprehensive look at immigration reform. “It strikes me as making no sense at all that someone who wants to get in line legally to come to this country and work here should have to hire an attorney to figure out how to do so, but our immigration system is an absolute mess,” he said. One woman raised concerns that Romney — who has denounced Trump’s leadership style — has deepened divisions within the Republican Party. Romney said he will stand with Trump and the GOP when it’s good for Utah and for the country.